Now most of my loyal Roxiticus Desperate Housewives readers know that I take a lot of photos….mostly of my two photogenic daughters, but there’s the occasional Roxiticus Sunset thrown in for artistic merit. I upload and print out about 10,000 photos per year and maintain a photo gallery web site for friends and family using Kodak Gallery. 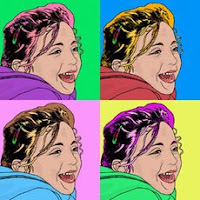 For something different than your average slide show, t-shirt or “World’s Best Dad” photo mug, I just found an extremely cool art reproduction web site that will create canvas photos in different artistic styles, all based on your original digital photo. For example, there’s Pop Art (like the image on the left), Lichtenstein, Che, Illustration, Opie, or Graphic). Getting from digital photo to finished masterpiece seems easy to do, and the prices seem reasonable to me….a 12 by 16 inch framed “simple edit” photo on canvas is $99, and you can add the “Pop Art Artistic Edit” shown in the photo here for $40 more. All orders are shipped via FedEx for no additional charge, so no worries about getting it there in time for Mother’s Day. This past Easter Sunday, in addition to hunting down the eggs the bunny hid in our backyard (0ne rotten egg still missing), Rex and I shared approximately 25o of our most recent 4,000 prints with Grandmom and Grammy. Instead of being met with oohs and ahs over their grandchildren, we were disappointed to hear them commiserating about their wasteful children: “Bree and Rex take pictures of those girls every time they turn around! I remember in my day, we just drew a little something with mud in the cave….” With Mother’s Day coming, I hope to swallow my pride and take the holiday opportunity to turn some of our many digital photos (the toothless school portrait? naked lawnmowing in Bay Head?) into Pop Art canvases for Grammy and Grandmom….maybe the Wicked Grandmothers would rather be presented with an original work of modern art than a huge stack of 4X6 prints.